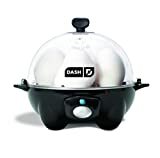 Breakfast is the most important meal of the day, and the Dash Rapid Egg Cooker is the most important thing that has even happened to breakfast. Forget protein bars that leave you hungry just a few hours later, because this device will cook up a full breakfast in a matter of minutes with almost no effort whatsoever. It can whip up perfect eggs in a bunch of different styles including scrambled, hard boiled, and even omelets, and it only costs $19.99 right now on Amazon.